Primarily designed for the suspension of sub grids and ceiling systems, Angles can be used for many general applications in ceilings, dry lining and cloaking deflection heads in partitioning systems. The channel sections have been designed to form sub grids for supporting any type of suspended ceiling. Channel Connectors are available for channels up to maximum 63mm base. 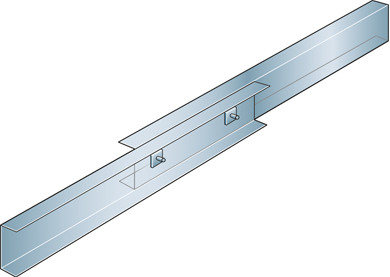 For joining 100mm base channels, the sections must be bolted back to back with a minimum overlap of 600mm. A minimum of two bolts must be used, at 500mm minimum centres. This method can also be used for the smaller channels if channel connectors are not used.